Camp John Hay is one of Baguio City’s busiest tourist centers. The resort once served as a rest and recreation haven for the Department of Defense employees and United States Armed Forces. The property is sprawled over approximately 695 hectares with forest preserves, a golf course, residential facilities, service-related businesses and ecotourism spots. Today, Camp John Hay is a well-visited attraction that lures thousands of local and foreign tourists every year. The resort’s charm lies in the mild climate of Baguio City which has earned it the title as the Summer Capital of the Philippines. Camp John Hay also offers a wide array of recreational activities, accommodations, shopping and dining venues, making it a one-stop tourist destination in the north. 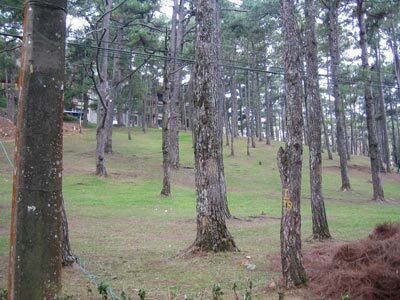 Camp John Hay is located on the southeastern side of Baguio City. Land travel is the easiest way into the city from Metro Manila. Baguio is accessible through Kennon Road, a scenic highway that winds along a narrow, steep valley. One must remember not to pass through Kennon Road during heavy rains as the mountainsides are prone to landslides and the road can be slippery. It is about a six-hour drive from Manila to Baguio, longer if you don’t leave early since traffic is at its worst in Manila during rush hour. Once you reach Baguio, it would not be hard to locate Camp John Hay. There is an entrance on Loakan Road and another one on the Baguio City Country Club road. If you’d like to see other attractions in the city, the second entrance will work best for you. Golf Course – Camp John Hay’s world-class golf course is designed by the famous Jack Niclaus. The par-69 course is spread over 48 hectares of land covered by bent grass and pine trees. Professional caddie services are available and patrons can rest at a world-class golf club house during breaks. The club house offers first-rate relaxation in its structure made of cedar logs imported from Canada. Guests can enjoy al fresco dining, massage services and even a sauna and Jacuzzi. Shalan ti Kabadjo – This is where families with children get to enjoy riding ponies amidst towering pine trees. The bridle path is stunning and there’s the scent of pine cones all over the place. Butterfly Sanctuary – This is another attraction best suited for those traveling with children. The sanctuary is built around the Little Mermaid garden and butterflies can be seen fluttering around the area enclosed by a light green mesh. The best way to visit the garden is during sunny days because this is when the magnificent creatures are most active. You might even get lucky and be able to touch them. A 20-peso admission is required for the sanctuary’s upkeep. The Mile Hi Center – A one-stop dining and shopping venue in Camp John Hay, this complex is a place where visitors can unwind, shop and indulge in the many treats that Baguio City is known for. Duty-free goods are available, as well as native Baguio trinkets and clothing apparel. Remember to buy the famous peanut brittle, a local delicacy. There are plenty of restaurants scattered around tourist areas in Camp John Hay, making it convenient for guests to grab a bite or a drink whenever and wherever. A large concentration of restaurants and cafes can be found at the Mile Hi Center and the Manor area. Dining options in this area include Le Chef at the Manor, Dencio’s Grill, Everything Nice Cake Shop, Brother’s Burgers and the Mile Hi Diner. There are also restaurants located close to the golf course like Cantinetta, House of Waffles and Le Chef at Golf Club. There is also a Starbucks café in the premises. Within Camp John Hay, visitors will find a wide array of luxurious accommodations with five-star quality. Most of these are vacation rentals owned by patrons of the resort. The most prominent place for accommodations within the resort is the Manor, a 189-room condotel that offers topnotch services and exclusive amenities. The Manor is a beautiful structure located close to the Mile Hi Club. Other properties in Camp John Hay are The Suites, Forest Cabins, Scout Hill Villas, Country Homes, Country Log Homes, Luxury Log Homes and the residential estates. It is important to note that staying in these properties costs top dollar due to the state-of-the-art facilities, winning amenities and premium services provided to all guests. Budget travelers may opt to stay in nearby hotels outside of Camp John Hay. The resort is open to the public and staying outside means you’ll get a lot of chances to explore more of what Baguio City has to offer. Excellent accommodations in the city include the Golden Pine Hotel , Hotel Veniz , Heritage Mansion Hotel and Microtel Inn . Camp John Hay is a perfect place to reconnect with nature and to literally be closer to the sky. The serenity of its gardens, the freshness of the air and the warmth of the people around you all add up to give you the ultimate getaway in the City of Pines.